The huge advances in medical devices, especially the new mobile and connected devices, are being driven by the latest developments in semiconductors. These include large scale integration and reduced power consumption, but also semiconductor devices specifically targeted at medical applications. In this article, we examine solutions from various suppliers. The medical electronics market is heating up. According to Databeans, a market research firm that tracks semiconductor shipments in the medical market, total market revenue will grow from $6 billion to $10 billion by 2016, with unit shipment increasing from 6 billion to 10 billion units in the same time period (Figures 1 and 2). This reflects the demand for medical electronic devices using medical semiconductors. For the most part, the growth will be in FDA Class 2, and to a lesser extent, Class 3 products. Class 2 products are bench-top, portable and wearable devices that are not invasive, while Class 3 devices are implantable units such as defibrillators. The driving force for the growth comes from the need to reduce healthcare costs, provide greater accessibility to healthcare services, and a desire for greater convenience. The healthcare industry is trying to keep healthcare costs from getting totally out of control. Healthcare costs are predicted to double the current $2.5 trillion in the next few years. 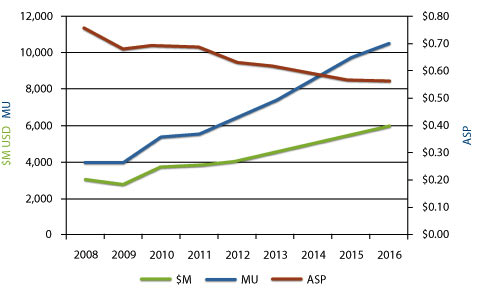 This is not a sustainable model. Better accessibility to services is much needed by people in both industrial and developing countries. Technology can help solve “the distance problem” and make healthcare services available to more people, as well as assist with overall disease management to achieve better health for underserved populations. The idea is simple—fewer doctors can serve more people with higher efficiency using medical devices that connect patients remotely to the caretakers. The idea of living better and more independently while staying in one’s own home (including homecare) is being promoted by many organizations including the Continua Alliance, a leading organization that released a specification on end-to-end connectivity and interoperability (Figure 3) in health delivery systems. Additionally, the Alliance has developed a certification program to help medical devices comply with the specification. While treating patients using various medical devices is a big market, another growing area of opportunity is fitness and preventative health. This includes exercise gear and personal health monitoring gadgets. This market is aimed at consumers who want to stay fit, and the expected volume for devices is large. Figure 1: Worldwide Medical Semiconductor Shipment Forecast. Source: Databeans Estimates. 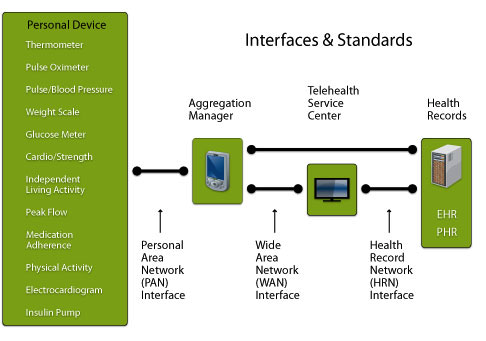 Continua has outlined how various devices would connect to Telehealth services (caretakers). A variety of devices are already available to monitor the condition of a person who wants to stay healthy and live independently. They include digital thermometers, pulse oximeters, pulse/blood pressure monitors, weight scales, glucose meters, cardio exercise machines, electrocardiogram devices and insulin pumps. Additionally, there are medical devices used in clinical applications such as ultrasound and scanning devices, digital stethoscopes, MRI and digital X-ray. How have semiconductors shaped the design landscape? Over the years, the features of lower power combined with more functions, including the front-end input/output (I/O) into a single chip, have made medical devices more portable. See photos of portable ECG device (Figures 4) from Philips Healthcare and portable ultrasound scanners (Figure 5) from GE Healthcare. Homecare devices, such as blood pressure monitors and glucose meters, are frequently battery operated. Overall they are more compact and convenient to use. 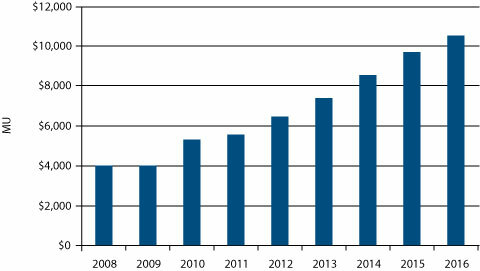 Figure 2: Worldwide Medical Semiconductor Market Forecast. Source: Databeans Estimates. Wireless technologies are becoming more and more commonplace with many new medical devices starting to integrate wireless features into the application. The Omnipod insulin pump developed by Insulet consists of two units: a pump worn by the patient with built-in wireless capability, and a handheld controller with built-in glucose meter. 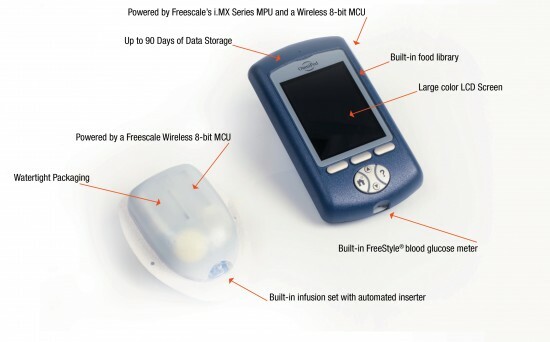 The user can control the delivery of insulin wirelessly. Omnipod provides great convenience to the userasitcanbeworn24hoursadayandisespecially desired by people with active life styles, including many athletes. To accomplish this, Insulet has used a microcontroller and wireless chip from Freescale, as shown in Figure 6. With the advancement of semiconductor technology, there are plenty of solutions available from many suppliers for medical device designers to choose from. What should a designer expect from a semiconductor supplier? Better support. Let us illustrate this with a thermometer design. Texas Instruments offers a single chip solution that includes a lowpower, single-chip AFE4110 microcontroller with built-in LCD driver (Figure 7). It comes with a reference design circuit schematic, printed circuit board (PCB) layout and the bill of materials (BOM). The designer only needs to follow the design and make some custom adjustments to deliver a complete digital thermometer with an accuracy of +/0.1 degree centigrade and a reading range of 31 to 43 degree centigrade. Figure 3: Continua’s vision of personal medical devices. Overall, semiconductor suppliers have done a good job in integrating the front-end analog-to-digital (A/D) functions in a single piece of silicon. 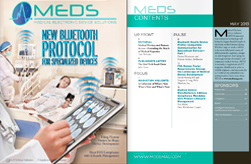 (For a detailed list of product offerings from various semiconductor suppliers, go to www.medsmag.com/sbb). Leading suppliers offer different solutions. Texas Instruments, Freescale and STMicro have the broadest portfolio including digital thermometers, weight scales, ECG/EKD/EEG electrocardiograms, glucose meters, insulin pump, pulse oximeters, blood pressure monitors and ultrasound/scanning devices. Separately, ADI and STMicro offer a MEMS motion detect solution for fall-detection and prevention devices. The innovation of ECG development is moving from portable to wearable. This solution will directly reduce healthcare costs. By wearing an ECG device, a patient with a heart problem can be monitored remotely by the caretaker without being in the hospital. STMicro’s battery-powered ECG semiconductor will be a good fit. More and more devices are connected to other devices/ controllers remotely using emerging wireless standards such as ANT+, Bluetooth, ZigBee and near field communication (NFC). Companies like Renesas, TI and Freescale all offer products in these areas under the umbrella of Mobile Health (commonly known as mHealth), or Wireless Health. Another important segment in medical electronic device design is that of sensors. Most people know wide area network (WAN) or local area network (LAN). Now a new term called BAN is emerging. It is the body area network in which the body acts as a network to connect to a medical device. It works by having a sensor connected to the human body and communicating electronic signals to the receiving device much like electrodes are connected to a human body. The sensor can be a passive device (does not require power) or an active device (requires power). A new innovation from STMicro can energize an active sensor without using a battery. The M24LR16ER product is based on RFID technology, which receives power from a remote controller sending RF signals to the sensor. 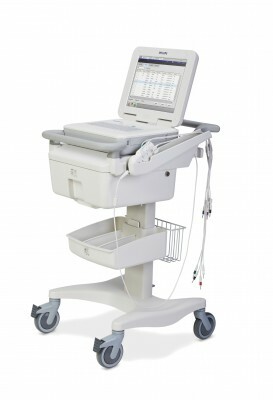 Figure 4: Portable Pagewriter TC70 Cardiograph ECG Device from Philips Healthcare. 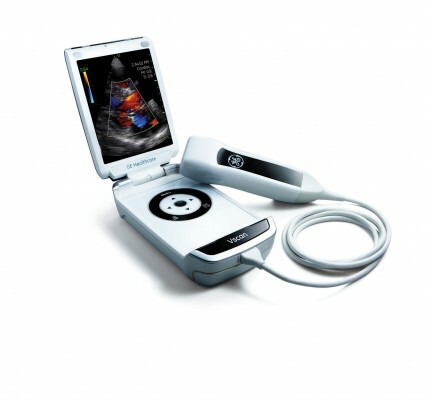 Figure 5: Portable Vscan Ultrasound Device from GE Healthcare. Figure 6: Insulet Omnipod insulin pump with wireless control. While all the companies above focus on many homecare devices, Intel is taking a different approach by offering point-of-care stations and hospital bedside entertainment systems based on the Atom processor. These are embedded devices with new applications. 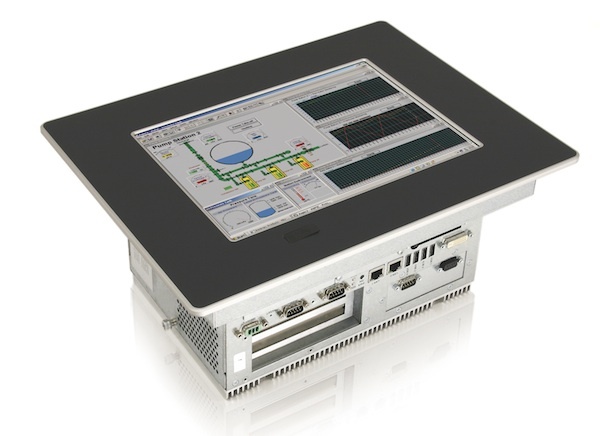 The Intel-based Point-of-care system from Kontron is such an application. Another vision Intel has is to enable developers to build high-end fitness machines where a PC-like display is mounted on a treadmill that would communicate with sensors or devices worn by the users. This provides feedback to the users while they are running on the machine. Additionally, the high-end graphics display can provide personal entertainment making exercising more fun. Figure 7: Texas Instruments thermometer (front and back): Complete reference design of single-chip digital thermometer from TI. Semiconductors have enabled medical electronic device reductions in size, cost and power consumption while boasting significant increases in overall performance. “Thanks to the semiconductor development, consumers can now buy pulse oximeters, blood pressure meters, blood glucose meters and bathroom scales for well under $50,” according to Chris Griffith, Medical Business Development Manager of Texas Instruments. 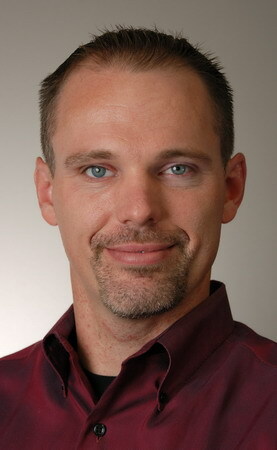 “And further integration of more functions on a single chip is expected in the future.” “There will be integration of wireless, configurable analog and embedded processing power on-chip enabling designers more flexibility in design,” commented Steve Dean, Global Healthcare Segment Lead of Freescale. Expect to see device developers continue to race to bring new products to market putting more functions into more compact designs. The demand for medical electronic devices will continue to be strong not only in the U.S. but in many other regions such as Asia and Europe. The ongoing challenges will be designing products that are easy to use by non-technical users, and that these devices will be able to connect to each other and share data securely and reliably with ease. This is easier said than done.